Our dry cleaning services include pre-spotting, eco-friendly dry cleaning process and press services for various fabrics of any garment types. 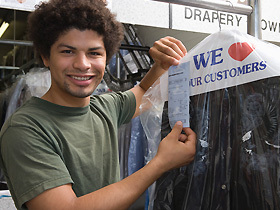 Our state-of-the-art machinery and cleaning techniques will meet your dry cleaning expectations. We also accommodate press-only finishing services to our valued customers. Our experience, in both perspectives of quality and service is incomparable with any other traditional dry cleaning service. Our expert seamstress will alter your garments to your perfection. Our onsite staff is trained to take the proper measurements and provide superb workmanship to your everyday alteration needs. We generally require a 5 business day turn-around time, and leather alterations may require additional time depending on the type of service requested. Please call us for rush service and any special requirements you may have. Our “Wash & Fold” laundry service is as easy as it can be. We pick up your washables, sort them, wash them, dry them, fold them as you would do them at home, and deliver them to your home or office at the time you prefer. All you have to do is to put the washables in a bag we provide, and leave it in the location where you want us to pick up. 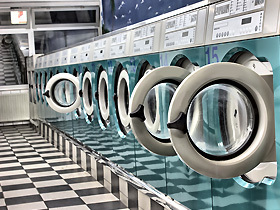 Our “Wash & Fold” laundry service is charged by its weight, and we require 8 Lb minimum per order. 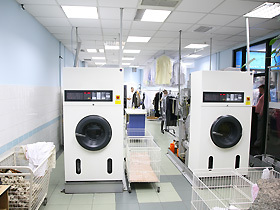 Our laundry services include pretreatment of collars, wash and press of laundered shirts. We also optionally package cleaned shirts in a box for traveling customers. There is an extra charge for boxed service.